The mandala has a long history of use in India, and it remains one of the most important symbols in Hinduism and Buddhism. While mandalas originated in parts of Asia, the shape of the circle is found in just about all cultures throughout the world as a way to represent the enormity of the universe, and the circular nature of life and existence. In Hinduism, the mandala is traditionally used as a way to meditate on life and to connect with the divine through focused contemplation. Use of the circular shape as a pathway to meditation and spiritual connection has a history almost as long as mankind and is found in cultures from Asia to the Americas. In India, it is estimated that the mandala began to be used as a religious tool around the 4th century, and it remains important to this day for practitioners around the world as a guide to spiritual transcendence and healing. One of the most common uses of the mandala was as a basis for design of Hindu temples. As these were sacred places meant to meditate on life and the divine, they were created using the circular template as a three-dimensional representation of the connection of the universe. The physical space contained in the mandala form is believed to represent the universe – including the earthly and spiritual realms – and is one of the chief ways that Hindu practitioners can focus and meditate on the sacred. Each design and element in a Hindu mandala serves a symbolic purpose, and therefore, contemplating or creating these works can be a highly detailed and ritualized process. One of the chief symbolic purposes of the mandala is to represent the different layers of the universe – the spiritual realm, the lived environment, the inner experience of man – and how each of these layers can flow into and out of the next. Therefore, the mandala is perhaps the most essential tool when practitioners seek enlightenment or spiritual connection. All mandalas are based around a circular shape, representing the enormity of the universe and the cyclical nature of life. Mandalas often build off a central point, and will include variations on geometric shapes or specific symbolic images depending on the chief purpose. 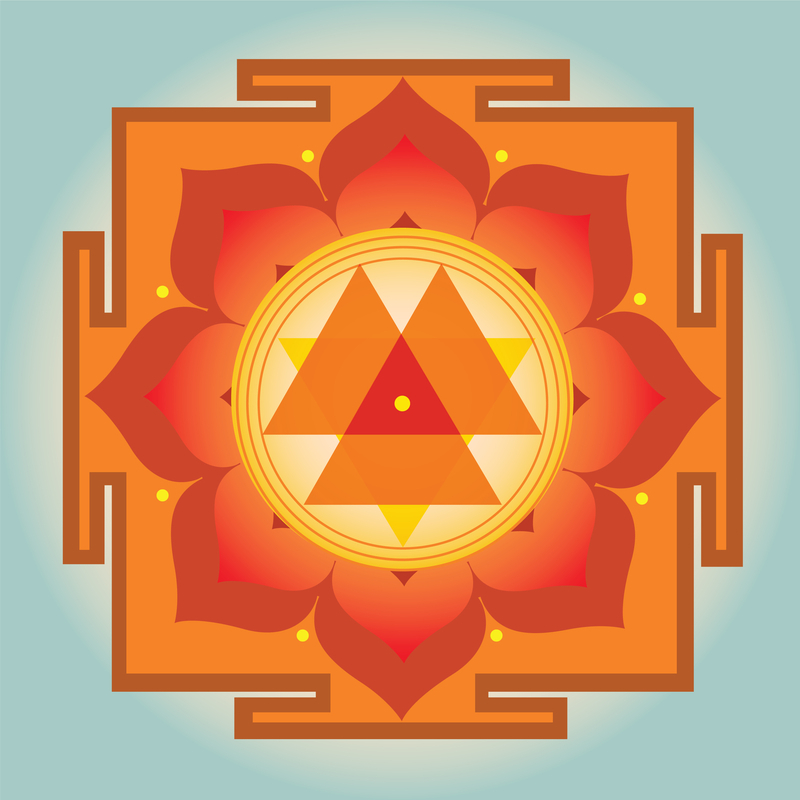 Perhaps the most common form of Hindu mandala art is the yantra. A yantra is a geometric design that represents the realm of the spiritual, and when it is created or contemplated, can represent communication with a higher power. 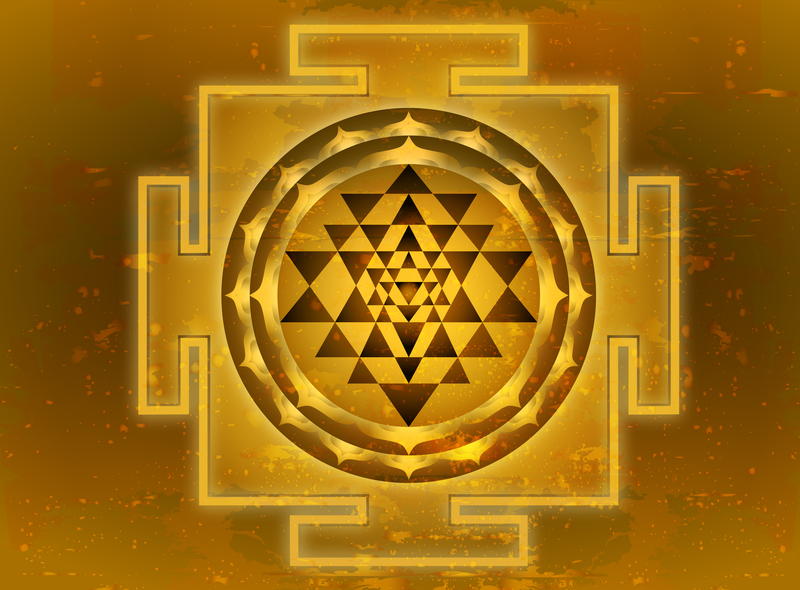 Therefore, yantras are often used in meditation practices and are considered to be sacred. The final design and arrangement of these pieces will depend on the deity to be honored or communicated with. Central dot (bindu): Represents both where the universe and the artwork starts, but also symbolizes the infinite nature of the universe. Lotus flower: These are often used to represent chakras, so moving from one to the next through meditation can help open and center these points. They also represent the unfolding of awareness of the meditative process, and many believe that the lotus itself resembles a symmetrical mandala, giving them importance in many Asian traditions. Triangles: These are one of the most basic geometric elements repeated in the yantra, but they can hold a variety of meanings. Upwards facing triangles represent action and energy towards the spiritual while downwards facing triangles represent creativity and the pursuit of spiritual knowledge.